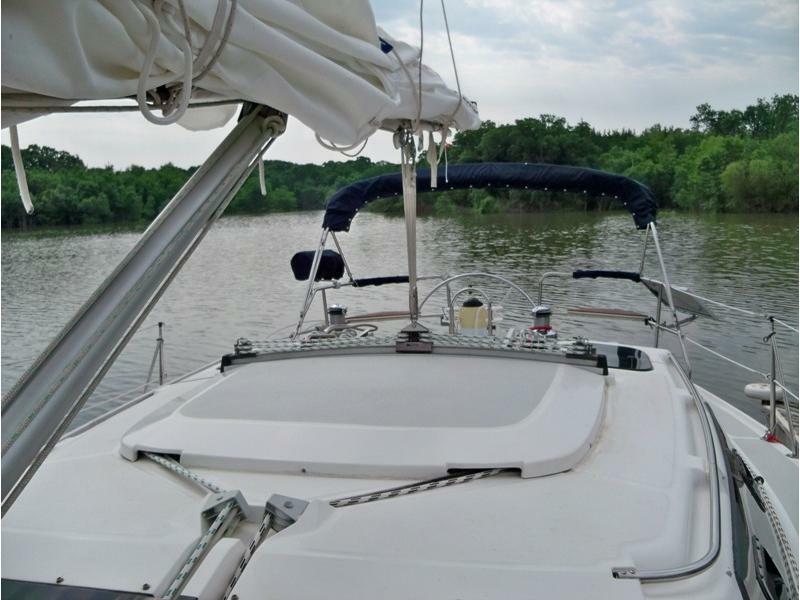 Perry Design Review: The Hunter Vision 32 innovative design works well for the first-time cruiser as well as the experienced sailor. 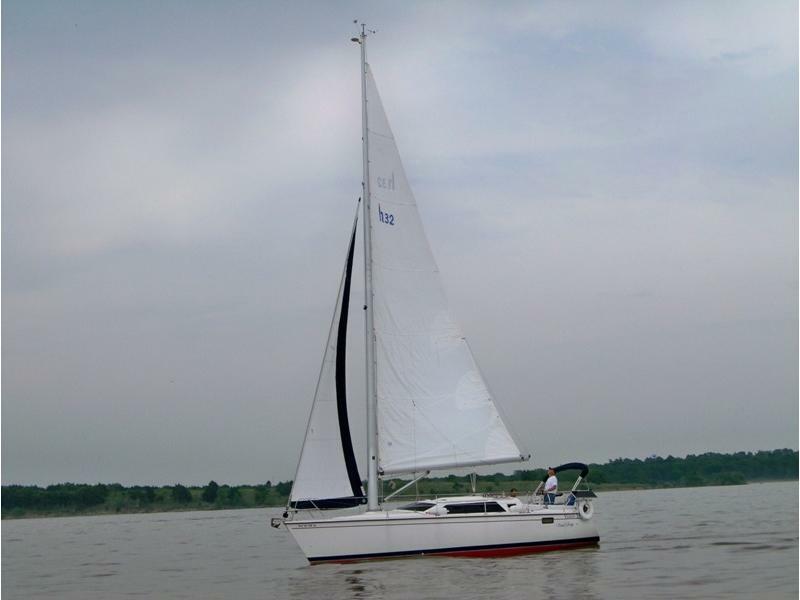 This sailboat eliminates the complexity of the standard rigs with shrouds and stayed mast. Hunter has put this innovative design together with comfort and simplicity receiving equal attention. Lets start with the sail plan. The mast is free standing. 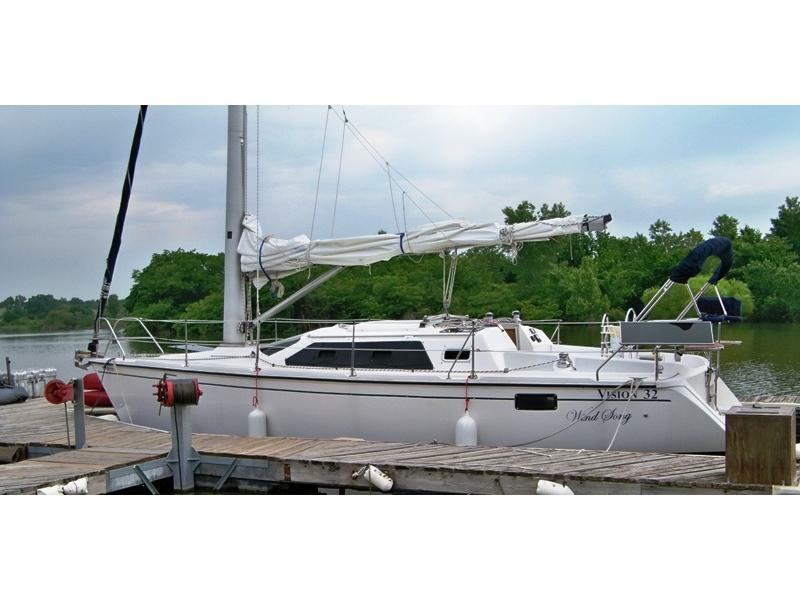 It has a high freeboard, large house making the Vision 32 a very modern looking boat. It shows careful attention to styling. The styling lines are very pleasing with fully battened main, electric winch and small non-overlapping jib with all self tailing winches. Sail handling has been reduced to the minimum complexity. Its an easy handling boat which can be single handed when desired. SA/D ratio is 17.9. With a D/L ratio of 259, the Vision 32 is a moderate-displacement design with 575 sq. ft. of sail total. The midsection shows moderate BWL and an arc-like shape with moderately firm bilges. The stern is very broad with a big swim step carved into the transom. 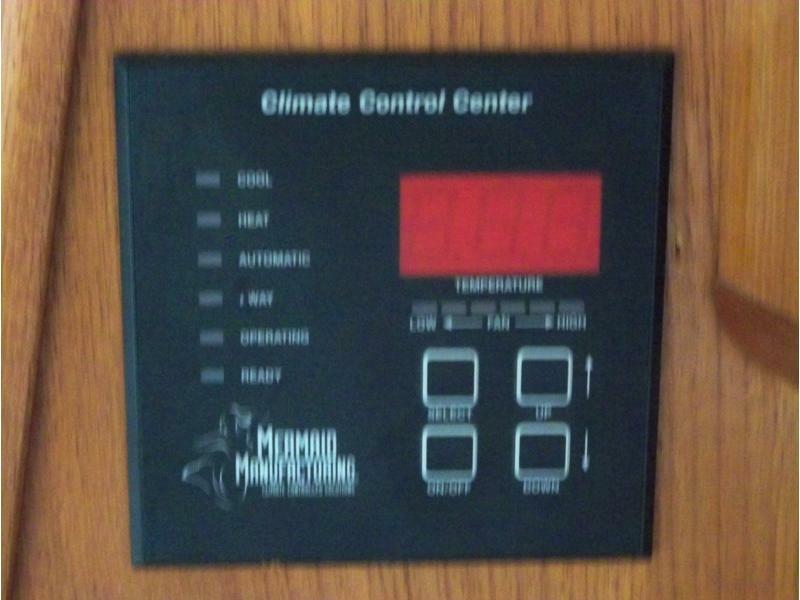 Hot/cold shower on transom. The keel is a fin-bulb-wing combination that gives 4-foot, 3-inch draft. 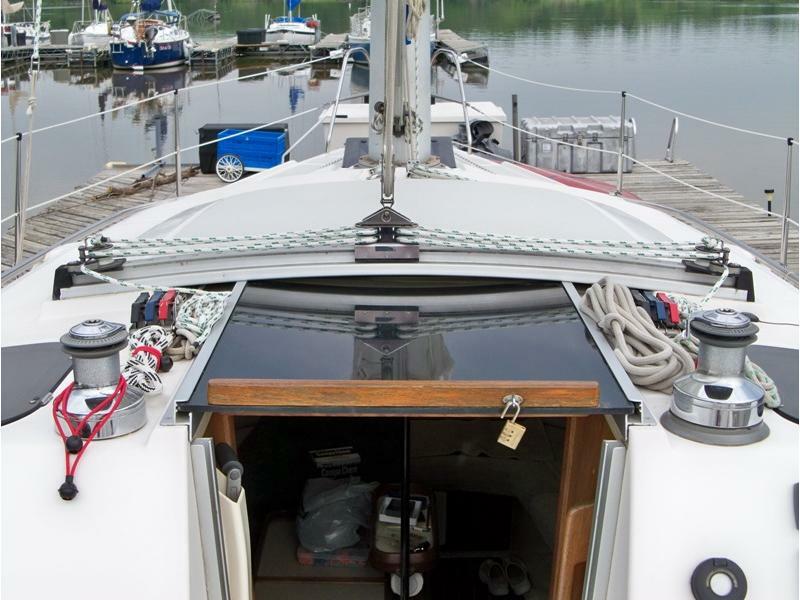 Obviously this hull has been optimized to provide interior volume, but the designers havent ignored performance. 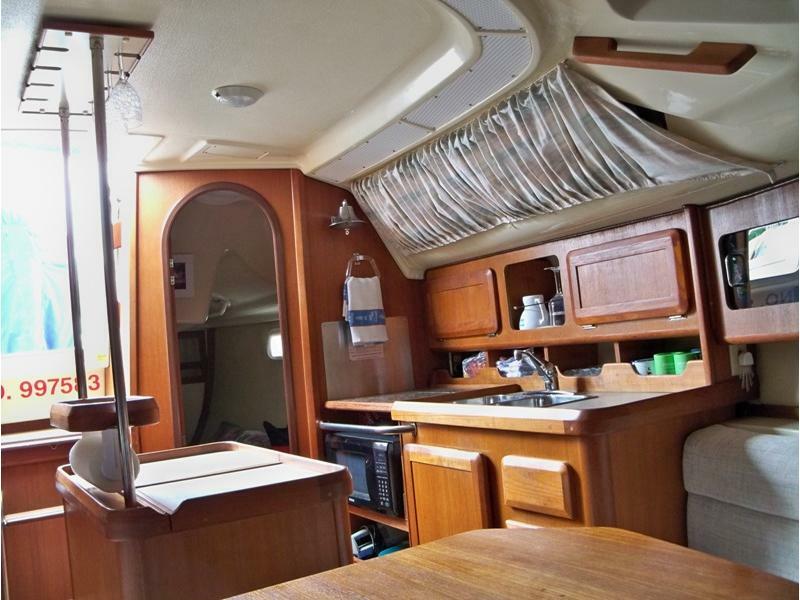 The interior borrows from the European competition, with a transverse double berth and a galley counter with separate standing icebox and wine glass rack overhead. Reasonable Offers accepted. 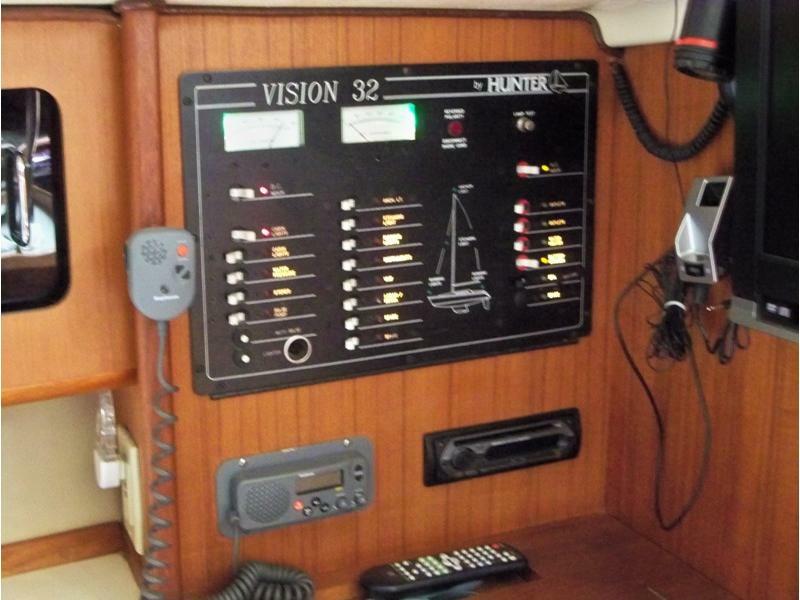 This Hunter Vision 32 is a versatile, lightweight and capable cruiser. 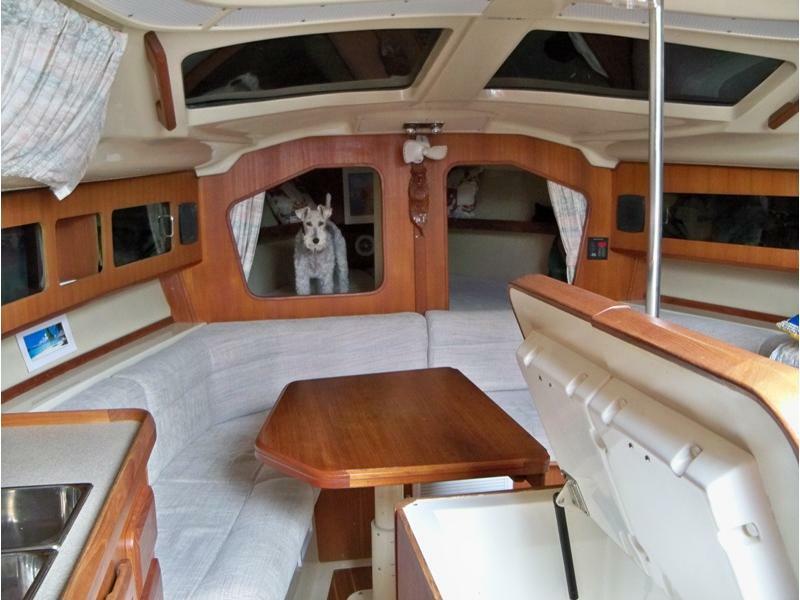 Clean and well maintained with many extras, she benefits from a very well preserved teak interior and offers up to six berths. The main cabin boasts exceptional space and volume with centrally located galley featuring island ice box with wine glass rack above and large counter-top areas and a pressurized hot and cold water system. The exterior is modern in appearance. 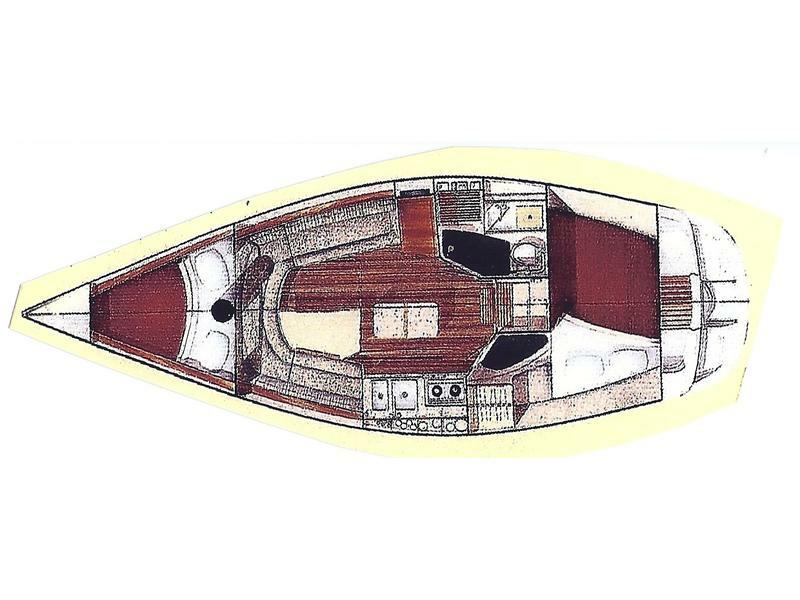 She has a powerful hull and an efficient deck plan, with all lines lead to the cockpit with rope clutches, offering perfect precision underway and sports car-like handling under both sail and power. There is a large electric winch to assist in pulling up the large main with ease. Ergonomic cockpit design allows for comfortable sitting at any angle of heel. The navigation station is to starboard, facing aft, for good communication with the cockpit while underway. The Main Salon has a unique layout which includes a large U-shaped dinette which may be dropped to convert to a double berth. You will find abundant storage space under the dinette seating and multiple large portholes provide ample natural lighting and visibility to the outside. 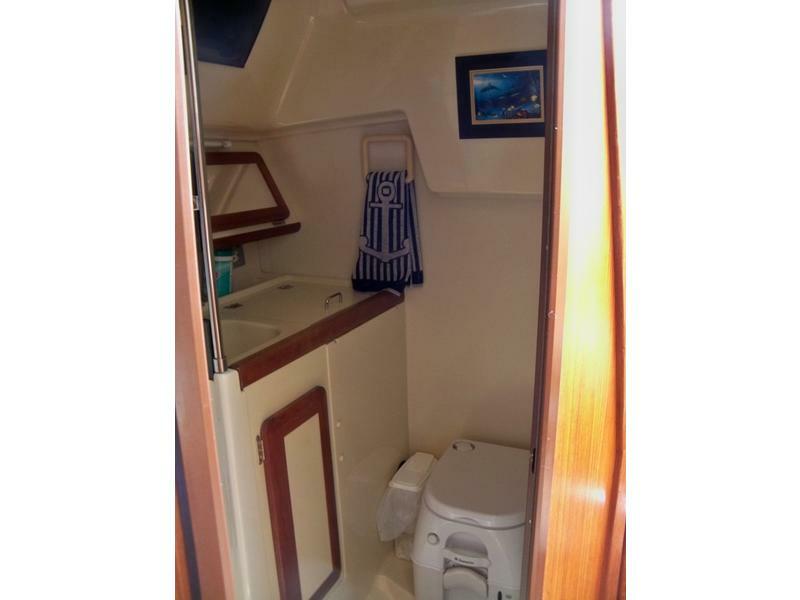 As you descend the companionway, the aft Cabin is to port with full headroom and large comfortable athwart ship sleeping accommodations. 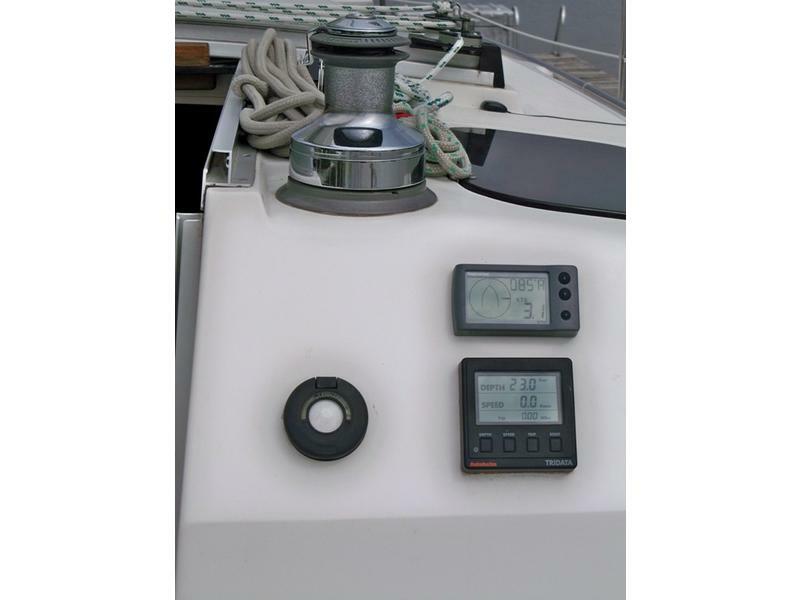 The head is to starboard behind the navigation station and incorporates a separated shower with hot/cold water. In the forepeak you will enjoy a spacious double berth extending you berthing or storage accommodations for longer trips. 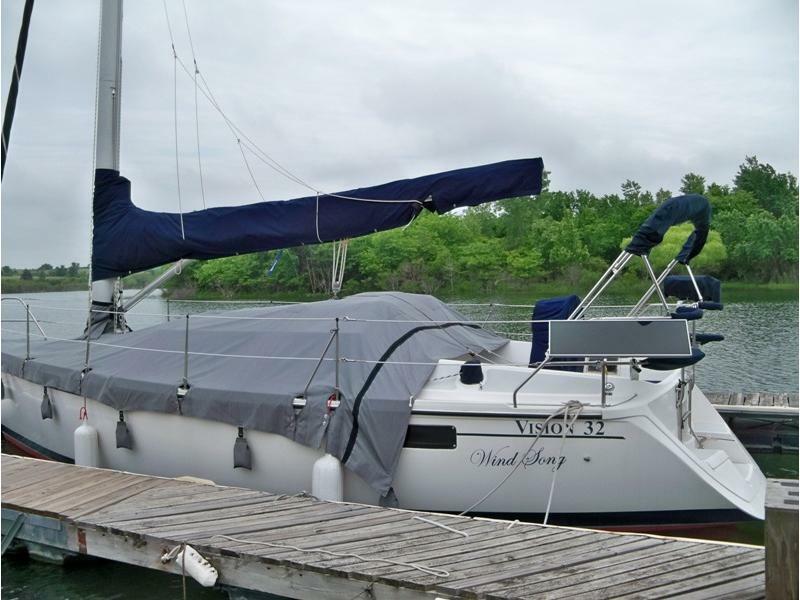 This is a great cruising boat with comfortable accommodations for extended trips and anchoring in scenic locations. Island Style Counter with ice box below. Roller Furling Headsail with sun shield Sail Care reconditioned & cleaned spring 2010. Full boat winter and ¾ summer cover. New Vivid Petit bottom paint spring 2011. 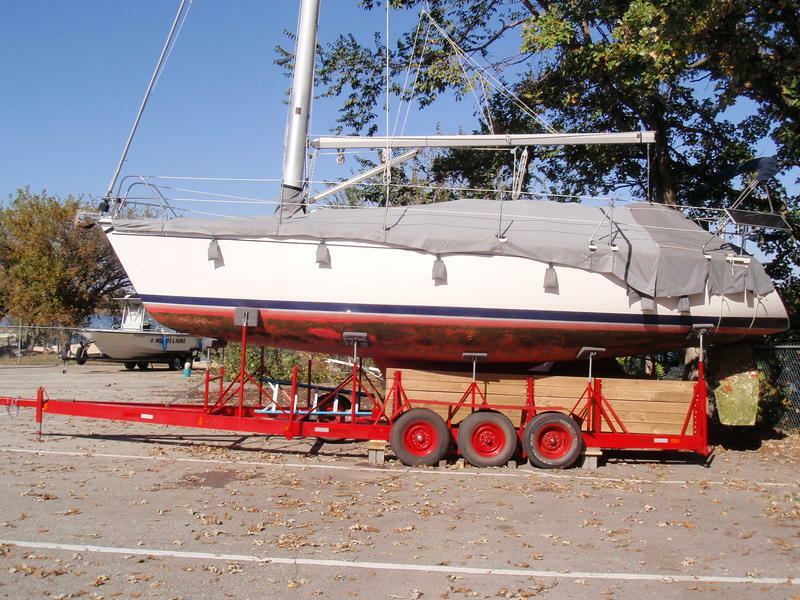 Boat yard trailer in photo also for sale separately.